Collection Information Bookings essential, call 1300 AAT KINGS (1-300-228-546). Work Hours Departs at 8:10am. Hotel pick-up available as well. Experience the beautiful sights of Melbourne with a Melbourne sightseeing tour; enjoy the shopping, sports complexes and universities. Visit Fitzroy Gardens and see Captain Cook’s Cottage. Captain Cook discovered the east coast of Australia. His parents’ cottage was sent here and reassembled in these gardens. See Parliament House, Windsor Hotel, Queen Victoria Market, the Melbourne Cricket Ground (MCG), Rod Laver Arena, Flinders Street Station, Young & Jackson’s Hotel and St. Patrick’s Cathedral. You will have the opportunity to stop for morning tea in the Botanic Gardens Café (own expense) and see the famous Shrine of Remembrance. Travel past the Grand Prix race track, the Westgate Bridge and over the Bolte Bridge for great views of Melbourne. View Port Phillip Bay, the Yarra River and Victorian Arts Centre and see the Melbourne Aquarium. 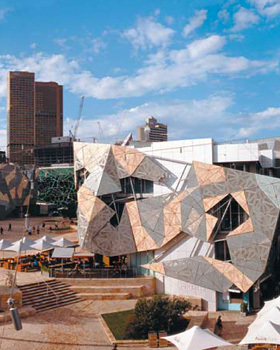 This tour begins and concludes at Federation Square, although there are pick-up options at certain hotels if you call ahead.